Two processes in particular are responsible for the enhanced radiation: bursts of star formation or the fueling of the supermassive black hole at a galaxy's core (an active galactic nuclei—AGN). Although in principle these two processes are quite different and should be readily distinguishable (AGN, for example, produce much hotter ultraviolet and X-ray radiation), in practice the discriminating features can be faint and/or obscured by dust in the galaxies. Astronomers therefore often use the shape of the galaxy's entire emission profile from the ultraviolet to the far infrared (its spectral energy distribution—SED), to diagnose what is going on. The dust that absorbs much of the radiation also re-radiates it at the longer infrared wavelengths and computer codes can model and unravel the numerous physical effects. If bursts of star formation were responsible for powering luminous galaxies in the early universe, then many of today's stars may have been formed in such events, but if AGN dominated, then there should have been more outflowing jets and fewer new stars. CfA astronomers Jeremy Dietrich, Aaron S. Weiner, Matt Ashby, Rafael Martínez-Galarza, Andrés Ramos-Padilla, Howard Smith, Steve Willner, Andreas Zezas, and two colleagues analyzed twenty-four relatively nearby, luminous merging galaxies to see how often and to what extent AGN activity powered the energetics. They extracted the most meticulous SED information in thirty-three spectral bands from seven NASA missions for these galaxies, correcting for backgrounds, confusion, and other extraneous signals. They then used a new computational code to fit the shape of the SED and to derive the most likely value of the AGN contribution, as well to measure the star formation rate, the dust properties, and numerous other physical parameters. 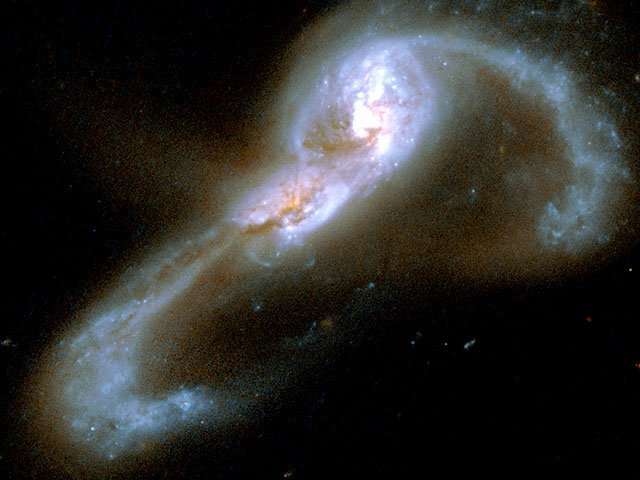 The scientists tested the reliability of the code by using it on simulations of galaxy mergers and found excellent agreement. I have an opinion that magnetism and magnetic fields of large astronomical structures needs more research. We see phenomenon on earth for things like lightning discharge which accumulate out of the tiniest of energies. Likewise we can see dramatic and powerful solar flares as the mag-lines snap. How these may interplay out and around SMBH and galaxies and clusters could hold much insight. but if AGN dominated, then there should have been more outflowing jets and fewer new stars. Assumption! Based on merger maniac models. The jets and star formation are more likely proportionate, since the jets contain largely newly formed matter ejected from the core mother star that then seeds the galaxy with star formation material.